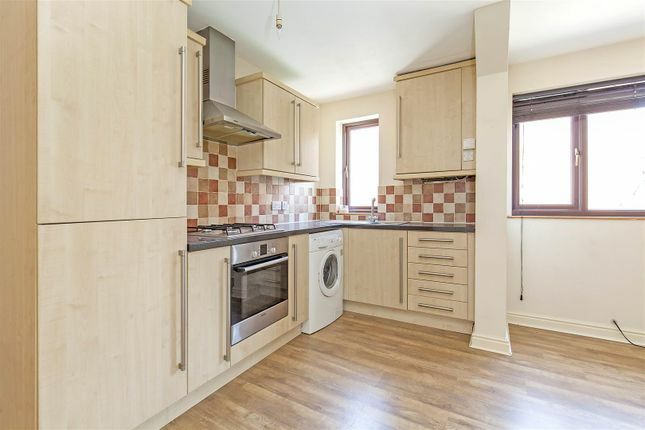 Occupying a Town Centre position is this neutrally presented one Bedroomed First Floor Apartment providing well ordered and contemporary styled accommodation, together with a parking space, being well placed for all the town centre amenities and for commuter links. Gross internal floor area - 39.3 sq.m./423 sq.ft. A communal entrance door with intercom gives access to a staircase which rises up to the Apartment. With laminate flooring and loft access hatch. The kitchen area being part tiled and fitted with a range of light beech wall, drawer and base units with complementary work surfaces over. Inset single drainer stainless steel sink with mixer tap. Integrated fridge/freezer, electric oven and 4-ring gas hob with stainless steel extractor hood over. Space and plumbing is provided for an automatic washing machine. A good sized double bedroom with openable ceiling roof light. Being fully tiled and fitted with a white 3-piece suite comprising of a panelled bath with glass screen and mixer shower over, pedestal wash hand basin and concealed cistern low flush WC. Heated towel rail and tiled flooring. Lease Term: 125 Years commencing on and including 1st January 2011.